Forget for the moment that the boat is called Corvette. As an analogy, think Mini Cooper. Both the boat and the car were beloved in Great Britain, their country of origin. Both were restyled and reintroduced to the U.S. market by a new company. Both have a unique look, and both are small for their type. 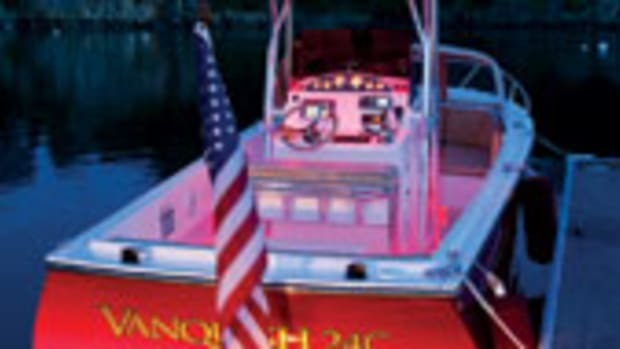 The Corvette is a 34-footer, and I took hull No. 1 for a spin. The Mini analogy is badly flawed, however. Unlike the little car, once a favorite of the British masses, today’s Corvette is not for us plebeians. She’s a yacht, with all the craftsmanship and attention to detail that the word implies — or, as the builder says, the “world’s biggest little yacht.” Ready to cruise, she costs about a half-million dollars. 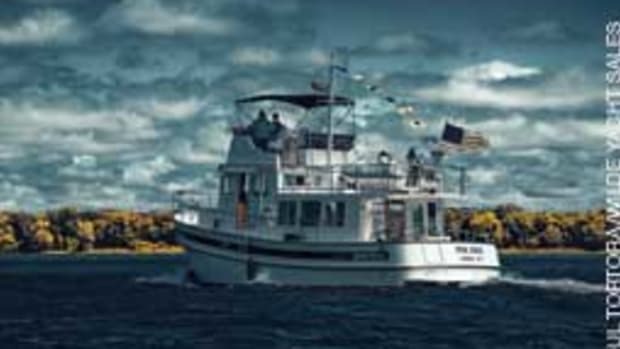 Since 1974, Corvette Marine of Norwich, England, had been building 32-foot trawlers with a unique hull designed by naval architect Terry Compton. The Corvette was refined through the years and earned a reputation as a good boat in rough seas. When the world began its descent into recession in 2008, the builder went into voluntary liquidation. 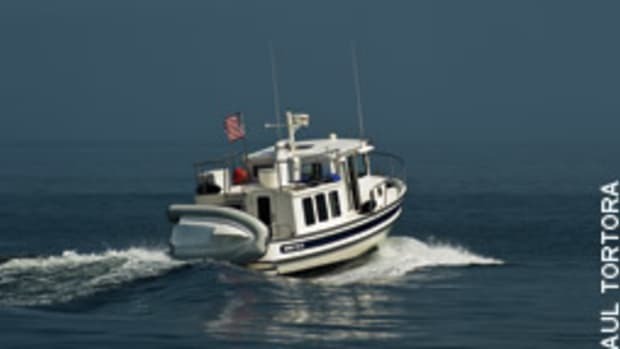 “It seemed a shame that such a proven and well-loved model may disappear, and so the idea of acquiring the molds and intellectual property of Corvette Marine came about,” says Duncan Cowie, a protégé of yacht designer Tony Fleming and manager of pilothouse motoryacht builder Fleming Yachts. The deal was done, and tooling and production of the Corvette were shifted to Taiwan’s Tung Hwa, the same yard that builds Fleming yachts. Tony Fleming himself is not involved in any way except as an inspirational force. The principals in the Corvette enterprise are Cowie and Adi Shard, another Fleming veteran. 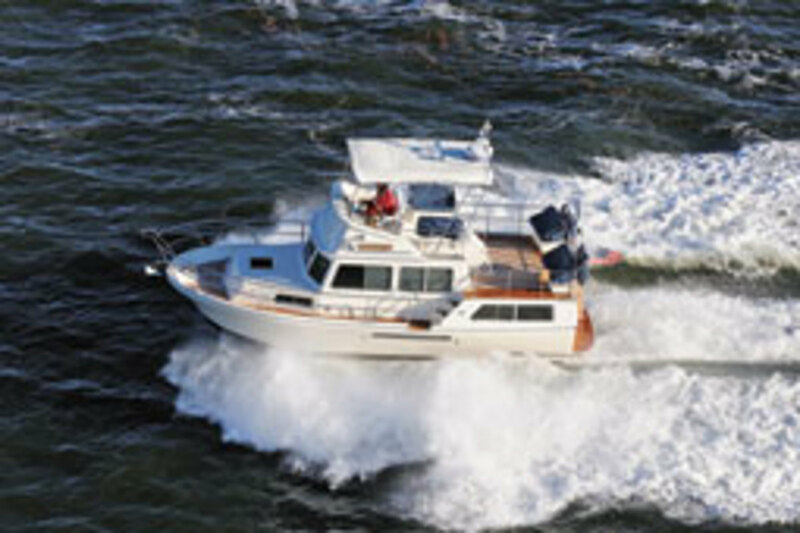 Fleming dealers will sell the Corvette, which in the United States means Chuck Hovey Yachts in Southern California for the West Coast (www.chuckhoveyyachts.com), and Burr Yacht Sales in Edgewater, Md., for the East Coast (www.burryachtsales.com). Indeed, after a visit to hull No. 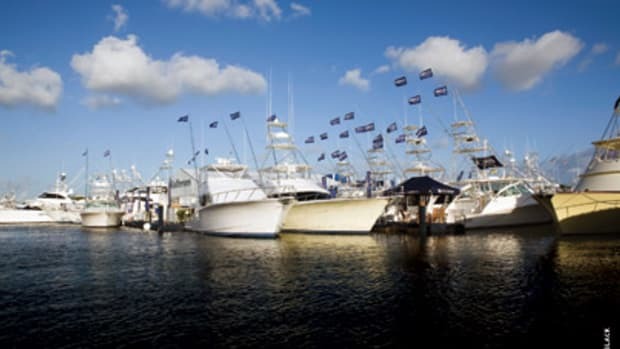 1 in Stuart, Fla., I walked through a Fleming 55 on the same docks. The outward quality and appearance were indistinguishable, most notably in the flawless gelcoat surfaces, the use of teak furniture and cabinets the color of honey, and teak soles inside and outside. The joinery is to megayacht standards. The stainless-steel rails have to be seen and gripped to be appreciated; they are at once beautiful and beefy. Under new management, the Corvette was lengthened to 34 feet, and the aft stateroom was extended to the full beam of the boat, which created a full-width sundeck above. The stateroom has a separate shower and head en suite, and there is a second head in the forward V-berth. The main saloon also was enlarged, without affecting the boat’s ample side decks. 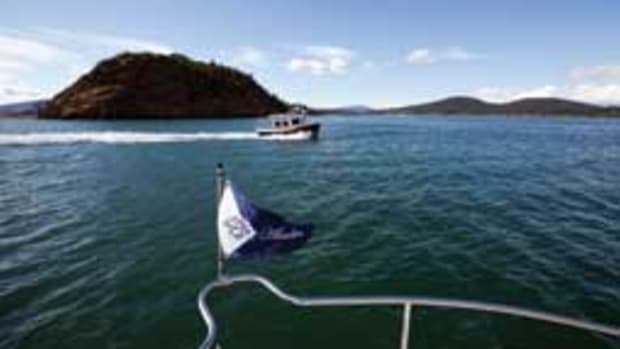 Corvette recommends a Seawise davit system to raise and stow an inflatable tender athwart the swim platform without removing the outboard. What did not change was the underbelly of the boat, which resembles the belly of a whale. In cross-section, its rounded shape flattens to a hard chine near the waterline. 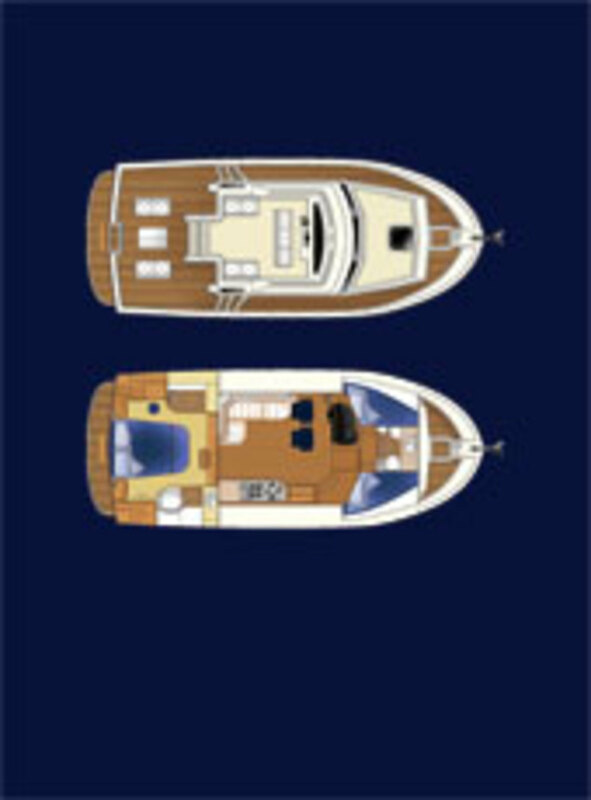 This marriage of displacement and planing hull features adds up to a semidisplacement shape, a term that also describes Nordic Tugs and older Grand Banks trawlers. The Corvette’s twin diesels lie low in that belly, so they’re more closely spaced than typical twin-screw arrangements. Delivery skipper John Pemberton and I found calm waters off Stuart, so there was no way to gauge the Corvette’s seakeeping prowess. She chugged along nicely at 8 knots and got up on plane so smoothly that it was difficult to detect the moment it happened. She went more than 21 knots at wide-open throttle, and when we tried a destroyer turn (full turn at full throttle) she did something interesting. First she leaned into the turn like a planing boat. Moments later, she shifted and leaned out like a displacement boat. George Sass Sr. is a retired ad agency owner and a friend of Tony Fleming’s. 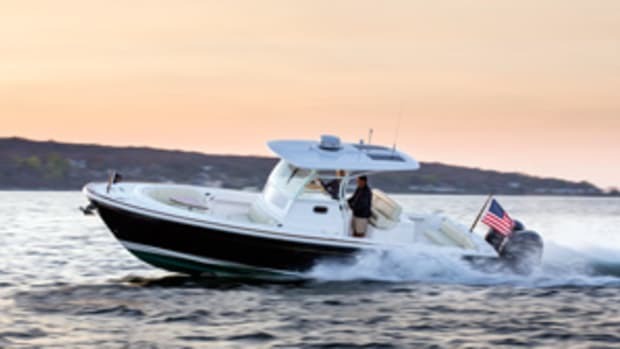 Sass (who occasionally writes for Soundings) is helping Corvette Marine with its U.S. marketing and in the process has piloted hull No. 1 for about a thousand miles. He praises the Corvette’s smooth ride and says the boat’s “sweet spot” is 18 knots. 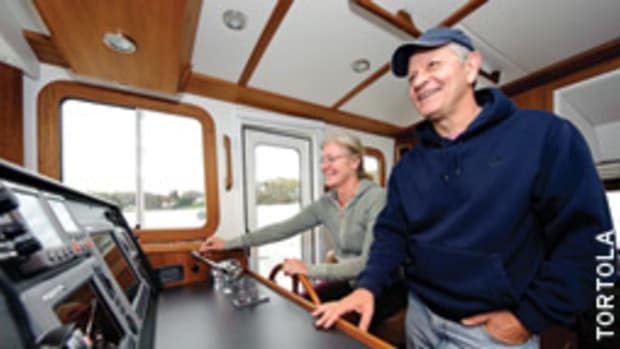 On a recent trip up the Chesapeake in nasty northeast conditions, Sass says that by slowing the boat to 14.5 knots the transit became tolerable enough to press on, when bigger boats would have sought shelter. This Corvette is powered by optional twin 330-hp Cummins diesels. At 18 knots, the reported burn is 23 gallons per hour; at 7.5 knots the burn is 5 gph. Cowie says he has come to believe these engines are physically too big for the boat. Indeed, they are just a few inches away from touching. 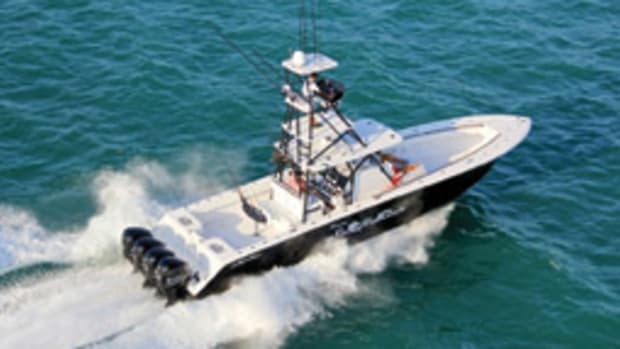 Corvette Marine lists the standard power as twin 315-hp Yanmar 6LP diesels, which have a smaller footprint. However, these are being phased out because of U.S. emissions regulations. “We are currently looking at a new Cummins VW [Volkswagen] engine and the Volvo D4 at 300 hp or less. These lighter, common-rail engines will no doubt be quieter, smoother and cleaner,” Cowie says. Other tweaks, effective with hull No. 4, include improvements to the helm and saloon, including the compact galley. As for overall aesthetics, the one knock on the Corvette, to my eye, is the boxy hindquarters, but this is the shape that makes possible one of the boat’s most impressive features. Look at the photograph of the master stateroom and reflect on the fact that this is a boat just 34 feet LOA. A queen-size berth surrounded by exquisite teak: I would call that a honeymoon suite.